Distant forebears of modern crabs and spiders may have helped to kick-start the explosion of marine diversity half-a-billion years ago. 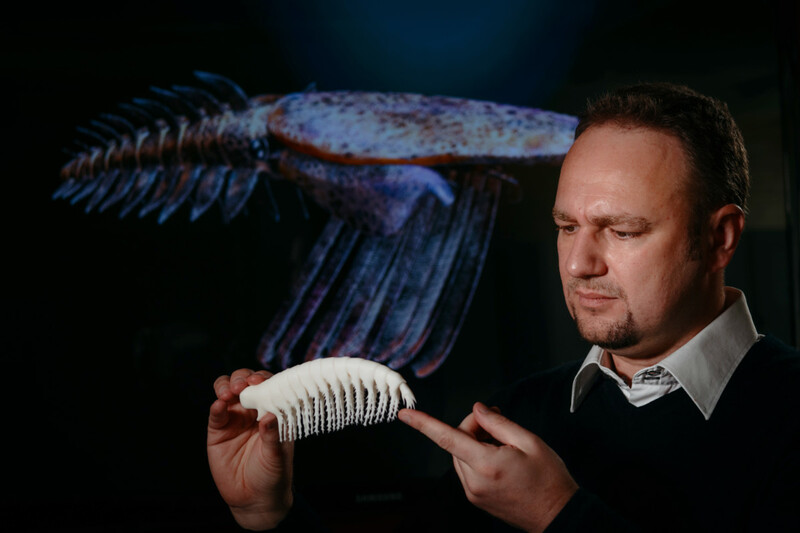 Image: Dr Rudy Lerosey-Aubril, of UNE's Palaeoscience Research Centre, examines a 3D-printout of a filter-feeding radiodont, an extinct arthropod. This species was found on Kangaroo Island by UNE palaeontologists, and is a relative of the 500-million-year old Pahvantia hastata, seen in an artist's reconstruction in the background. This younger species has been central to a new theory formed by Dr Lerosey-Aubril and colleague Stephen Pates about the diversification of life in the oceans. A University of New England (UNE) palaeontologist believes that free-swimming animals in the Cambrian period helped kick-start the diversification of life on the ancient seafloor. It was at this time - 540-500 million years ago - that complex animals first evolved and rapidly formed modern-style ecosystems in the oceans. Dr Rudy Lerosey-Aubril, of UNE's Palaeoscience Research Centre, has been working with University of Oxford PhD student Stephen Pates to investigate well preserved fossils of a long-extinct arthropod (Pahvantia hastata) found in Utah, USA, 30 years ago. These enigmatic fossils represent an atypical member of the order Radiodonta, a group of distant relatives of crabs, insects, and spiders. Pahvantia hastata (pictured here in an artist's reconstruction) appears to have played a very important ecological role in the warm equatorial sea that covered western USA at that time. Unlike most other radiodonts, which were fearsome predators (see UNE Pulse blog), Pahvantia fed on microscopic organisms floating near the ocean surface. “Pahvantia swam near the surface of the ocean, where it captured animal larvae and unicellular algae using filtering head appendages,” said Dr Lerosey-Aubril. “Like the baleen of whales, these appendages were equipped with numerous filtering hairs, instead of the stout deadly spines found in typical radiodonts." Little is known about the first free-swimming organisms: most of our understanding of the early evolution of animals has come from those that lived on or near the seafloor. This new study, published today (Friday 14 September) in Nature Communications, not only confirms that large nektonic animals roamed the water column 500 million years ago, but also suggests that their evolution contributed to the establishment of the biological pump. Primary producers such as unicellular algae and cyanobacteria are so small that, once dead, they are recycled by bacteria before even sinking down the water column. In contrast, planktonic animals feeding on them – and the larger animals eating these primary consumers – produce faecal pellets and carcasses, which represent much larger and more rapidly sinking particles. These organic remains eventually reach the seafloor, where they are consumed by benthic organisms. 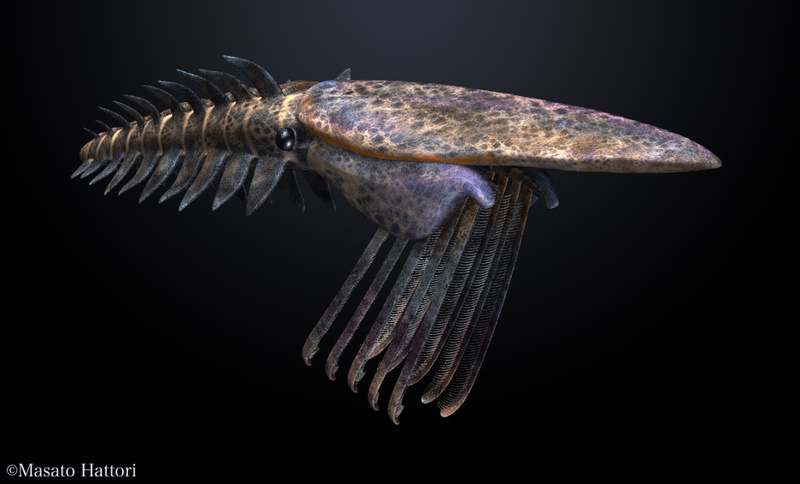 Some scientists believe that the evolution of the first planktonic animals in the Cambrian initiated the biological pump, which, in turn, fuelled the diversification of complex animal communities on the seafloor. A couple of filter-feeding radiodonts were already known from early Cambrian strata of Australia and Greenland. Like Pahvantia, they were large free-swimming animals (bigger than 20 centimetres in length). However, as revealed by the preparation of a new fossil from the Kansas University Museum of Invertebrate Palaeontology, Pahvantia fed on considerably smaller particles. The mesh size of its filtering appendages was so small that it could trap large phytoplankton, in addition to small planktonic animals. “Our study shows that the pelagic food webs, like the benthic ones, were already very complex in the Cambrian," Dr Lerosey-Aubril said. "As soon as macroscopic, highly mobile animals evolved, they radically and irreversibly changed the way organisms interacted on our planet." UNE’s Palaeoscience Research Centre has the origin and early evolution of animals as its flagship research topic. This is the main research focus of Dr Lerosey-Aubril, who joined UNE in 2015 to work with Australia's leading expert on the topic, Professor John Paterson.